Frequent attacks of headache, migraine, or non migraine variety; have proved to be a pain in neck not only for the patient who have it, but also for the physicians who treat them. Well migraine headache has been described as an episodic, paroxysmal, headache, usually but not necessarily affecting one side of the head which may or may not be associated with giddiness, nausea, vomiting, or visual impairment. The painful episode of migraine is usually intense and lasts for half an hour over a couple of days. How does it occur? The exact cause often remains unknown. It has been proved that migraine is a vascular disorder. Due to some triggering factors, varying from person to person there is some kind of vasoconstriction, vasodilatation, of the branches of the carotid artery (the major neck blood vessel), which leads to throbbing, and attack of the headache. While the exact cause is unknown, it has been observed in practice that migraine is often psychosomatic in origin. There are migraine personalities and we have observed in a study of series of migraine patients at our centers that, there is also a common thread in the migraine personality type. Many independent studies at various institutions have also shown that most migraine sufferers show one or many of the following behavioral patterns conscientiousness, fastidiousness, rigidity of views, constant conflict between the environment and self, high level of expectation. Migraine sufferers are more females than males. However we are observing the shift, migraine has also been observed to be running in the family, showing hereditary links. The symptomatology of migraine: Migraine headache is a subjective experience. The commonly described pain is typically throbbing, bursting, hammering or shattering. Pain might start on one side or a spot on the head and spreading to any other place. Ocular areas are often affected. The pain is usually severe intense and tensed to be associated with nausea, grid ness and generalized sense of malaise. Many patients feel relieved if there is vomiting. The episodes of pain are periodic, may be weekly daily, fortnightly, monthly or irregular. Migraine headaches should be differentiated form other similar painful conditions where the headache could be due to high blood pressure, sinusitis, trigeminal neuralgia, temporal art rites, tension headache etc. A good clinician can help the patient arrive to a correct diagnosis. Homeopathic treatment for migraine has been believed to be an obstinate condition to treat. However it is a common experience of the practitioners of the homeopathic system of medicines that migraine is curable. 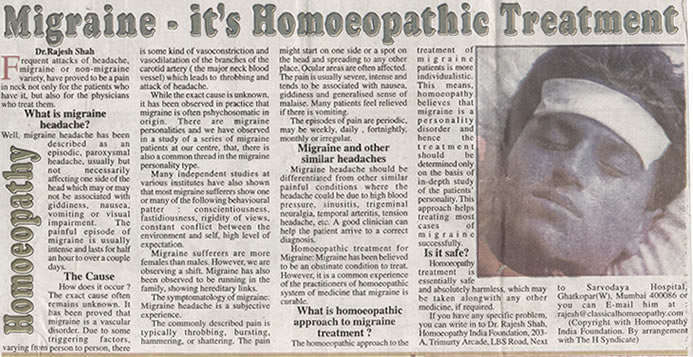 What is Homeopathic approach to Migraine Treatment? The Homeopathic approach to the Migraine patient is more individualistic. This means homeopathy believes that Migraine is a personality disorder and hence the treatment should be determined only on the basis of in-depth study of the patient's personality. This approach helps treating most cases of migraine successfully.